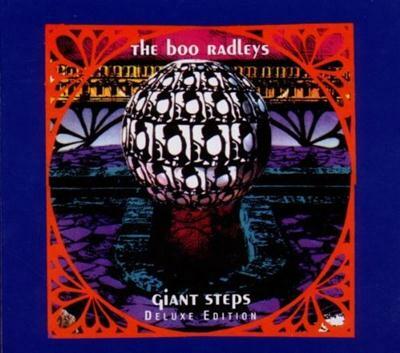 Giant Steps is the third album by the Boo Radleys, released in 1993. NME and Select named it as album of the year. It reached the UK Top 20, but did not spawn a Top 40 single. The title is inspired by John Coltrane s album of the same name. The Boo Radleys were never comfortable fitting into any of the easily defined categories that pigeonholed so many British bands in the early 1990s. Arriving on the scene as shoe-gazing My Bloody Valentine wannabes, they signed to Alan McGee's hip-to-the-times Creation Records, They surprised everyone by releasing Giant Steps in early '93. Living up to its title, the album is indeed a step above and away both from what their peers were doing and what was expected of the band themselves. The album is a cornucopia of varying influences, from the Smiths-y Wish I Was Skinny to the lovely brass arrangement in Lazarus . Giant Steps is a mouthful, containing 17 songs, but it's also their definitive album. This re-issue brings together all the b-sides and singles from around the time into one great triple CD. 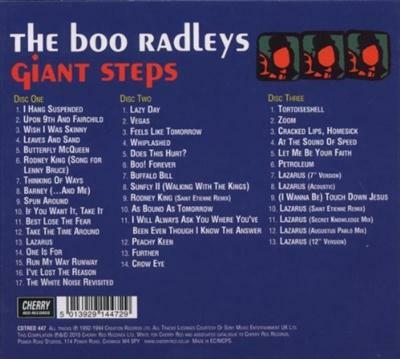 If ever a group were deserving of rehabilitation, it is the Boo Radleys. In that grim time when if you didn't like grunge, all you had was Suede or Cud, they synthesised the many factors that had made the Liverpudlian musical past so great. Mixed with a huge dose of the American sunshine psych-rock so beloved on Merseyside, the Boos acted as a bridge between The La's and The Coral. And Giant Steps was their crowning glory, lofty in ambition, widescreen in its production. It is hard to believe that it is now 14 years old, and at the time it topped the NME Reader's Poll and was Select's album of the year. Giant Steps is still, as the Virgin Encyclopaedia Of Popular Music heralds 'dripping with poise, attitude and melody.' Leader Martin Carr's ear for a tune is unimpeachable - the indie chime of "I Hang Suspended", the bright "Wish I Was Skinny"; there is feedback ('Leaves and Sand'); funky undercurrents ('Upon 7th and Fairchild', 'Lazarus'); humour; synthesizers, touching interludes and lots of big, big noise. Meriel Barham - vocals on "Rodney King" and "One Is For"
Chris Moore - trumpet on "Lazarus"
Margaret Fiedler - cello on "Lazarus"
Keith Cameron - vocals on "The White Noise Revisitied"
Yvette Lacey - vocals on "The White Noise Revisitied"
Moose - handclaps on "Wish I Was Skinny", vocals on "The White Noise Revisitied"
Kle - vocals on "The White Noise Revisitied"
Laurence - vocals on "The White Noise Revisitied"
Nick Addison - vocals on "The White Noise Revisitied"
Guy Fixsen - vocals on "The White Noise Revisitied"
Russell - handclaps on "Wish I Was Skinny"
The Boo Radleys - Giant Steps [Remastered DeluxeEdition] (2010) Fast Download via Rapidshare Hotfile Fileserve Filesonic Megaupload, The Boo Radleys - Giant Steps [Remastered DeluxeEdition] (2010) Torrents and Emule Download or anything related.